If you follow us, you will remember that we were at Padre Island National Seashore or North Padre Island, staying at the national park. 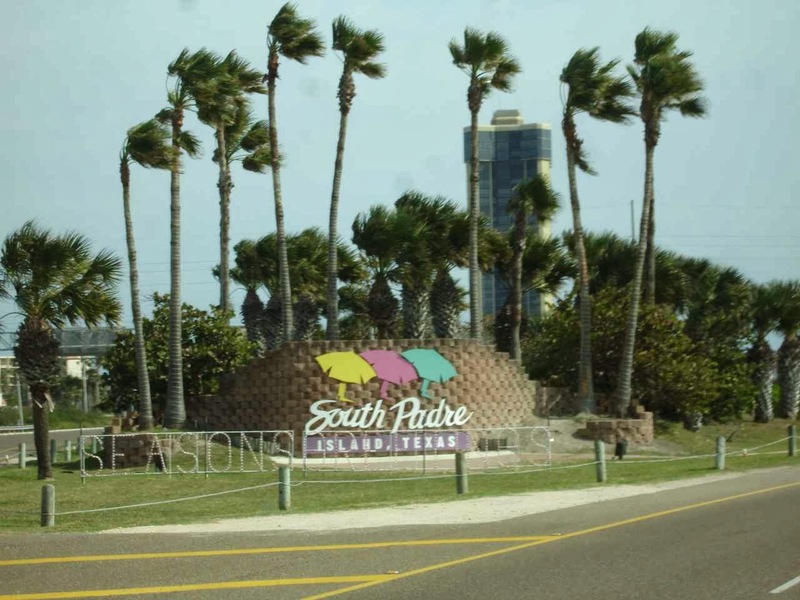 After a few stops, we decided that we had to visit South Padre Island and see what all the excitement was about. 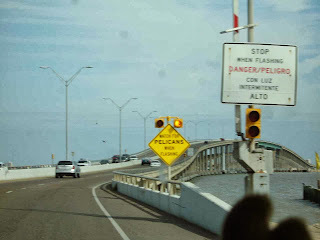 This road picture is a little fuzzy , but you had to see the signs warning you about the pelicans. 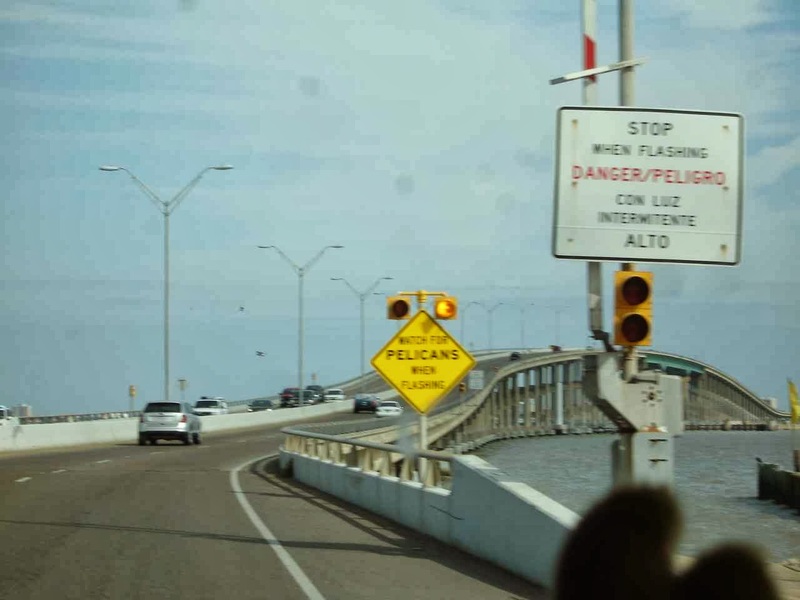 Even though the sign was flashing, we had no problem with pelicans on the bridge. Still on the bridge, you get an idea of the popular section of South Padre. Reminds us a little of Cocoa Beach or other Florida beaches. 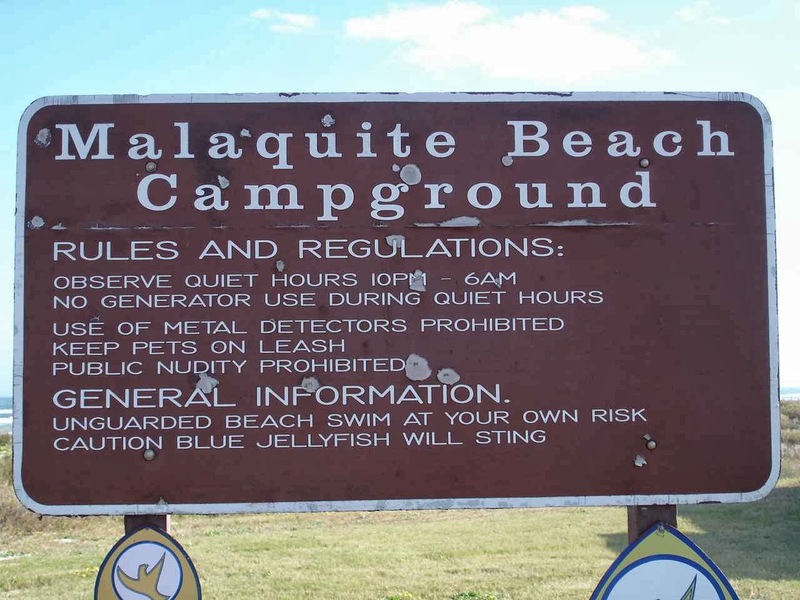 There are not a lot of choices for camping on the island. There is a KOA and Isla Blanca County Park. 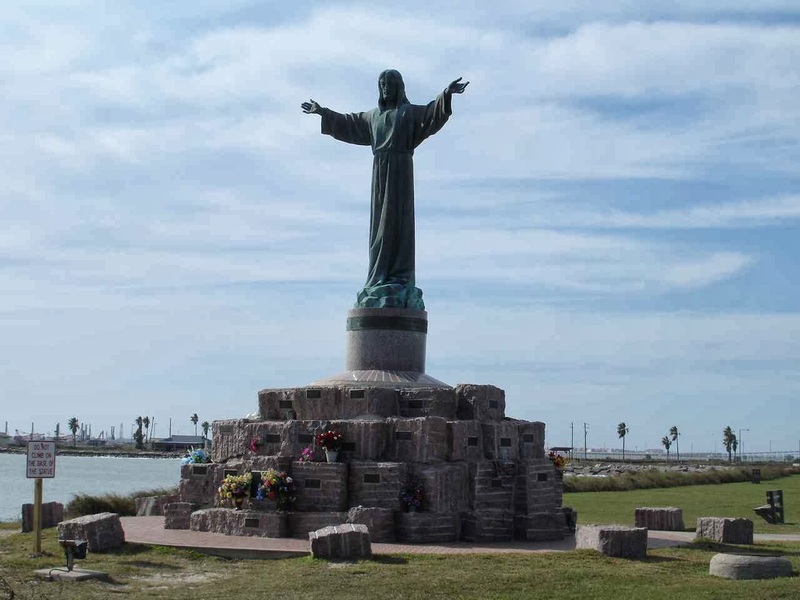 Jan and I pick the county park and settle on a site where we can look out our back window to the Gulf and this statue of Jesus welcoming the fishermen back to port. Similar to other fishing ports there are names listed of those who lost their lives at sea. 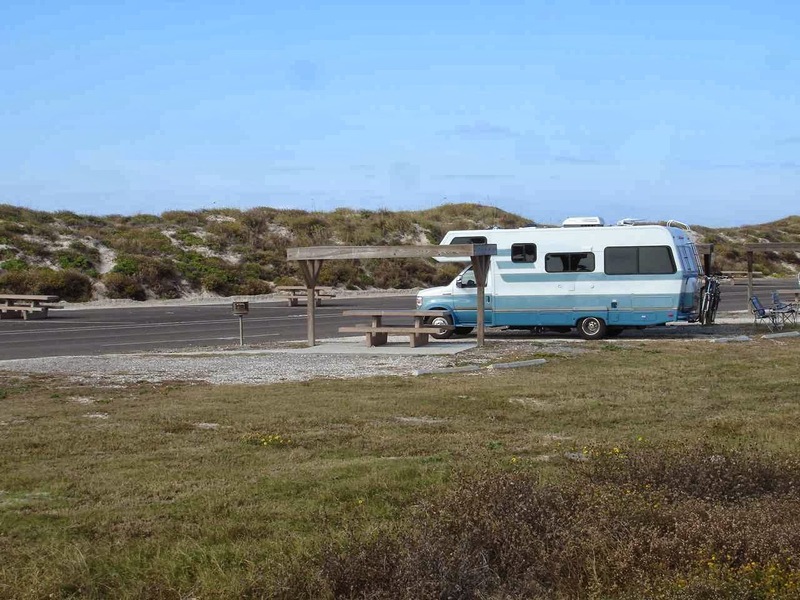 Our campsite allows us easy access to the beach. 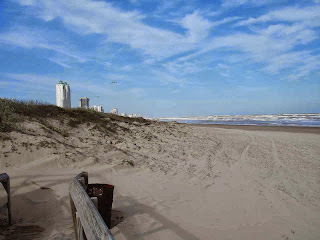 We are at the south end and this is our access to a breakwater and the beach to the left heads up to the large hotels. A little choppy with the red flag flying. But ,a nice white sand beach. This beach is quite flat and hard enough to ride bikes and in some places, cars. Quite cold on this day, but we had hours off walking on Christmas with just shorts and t-shirts. 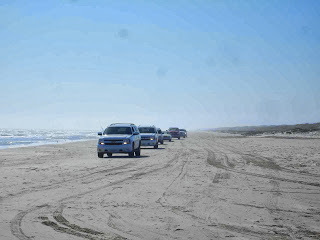 From our campground, you can see up the beach to the large hotels. An hour's walk brought us quite a ways up into the hotel section. Right outside the entrance to the park are a number of restaurants. 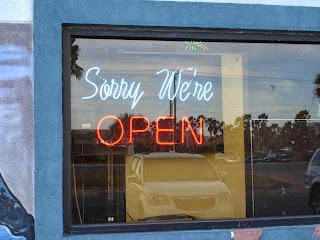 But, most of them do not open until 5:00pm. 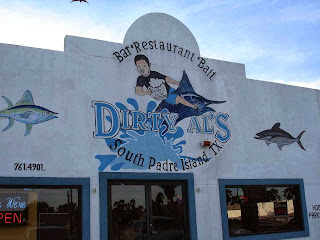 But, -----we see Dirty Al's. How could you not want to try Dirty Al's? 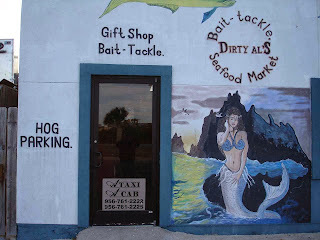 Not only is it a seafood restaurant at the marina, but is also sells bait and tackle. Two things caught our eye. "Hog Parking". We assume means Harley Davidson parking. And , if you look at the sign on the door , there are two numbers to call for a taxi. HMMMM? It is an interesting restaurant inside. You can tell it would be quite popular during Spring Break. 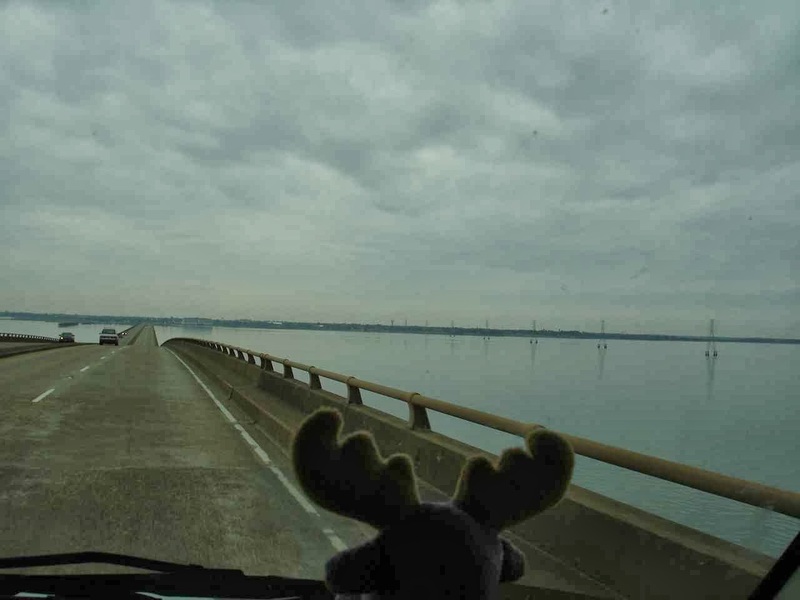 Our office manager at the campground was telling us that the bridge we came across--with no traffic---would be backed up 20 miles or so during Spring Break with people trying to get on the island. It takes him hours just to get to work. 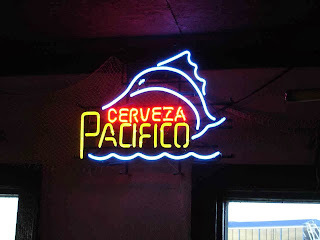 I had to take pictures of these neon signs inside. Not the usual up north. Our meal was great, by the way. Oysters on the half shell and fried. 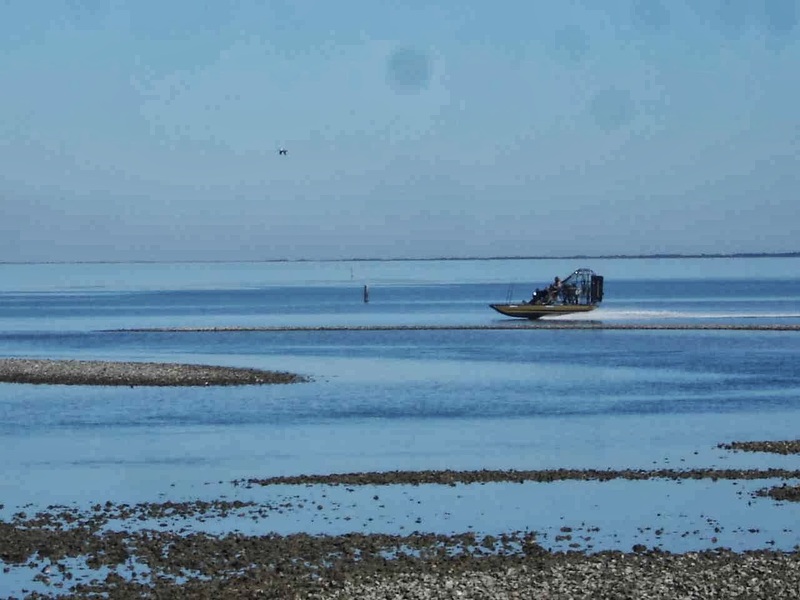 They are local oysters from Galveston way. Larger than Wellfleet , but very tasty. Also some wonderful fried shrimp. Jan even opted for a margarita. 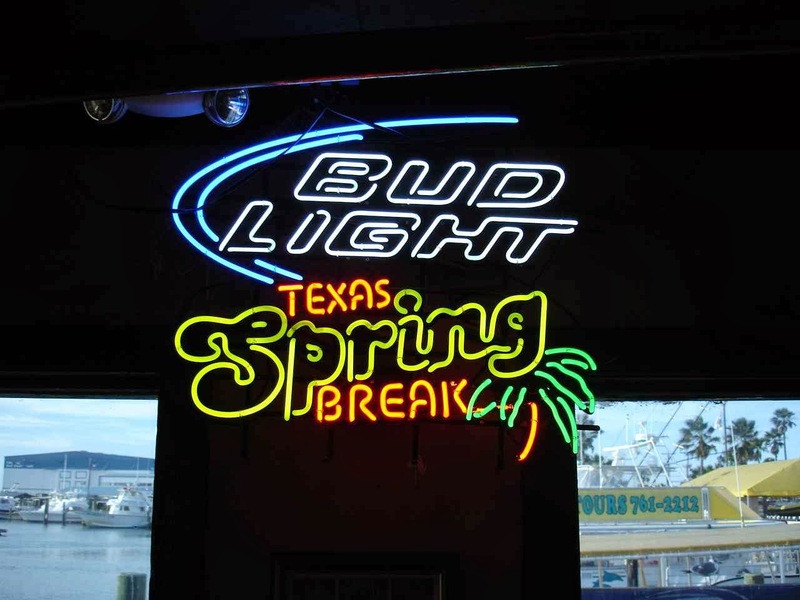 A number of posters from this past Spring Break line the walls and ceiling. I like the sign. 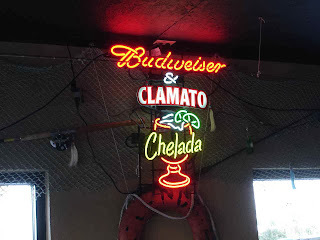 But someone will have to tell us what a Bud and Clamato Chelada is. At this point, I think some of you can claim you do not know this lady standing next to the art relief. But then again, yes----, that is Jan, Mom, and Grammy. She is on the left, by the way. As we are leaving, we have to take a second look at the sign in the window. Out Lady Blue's back window. 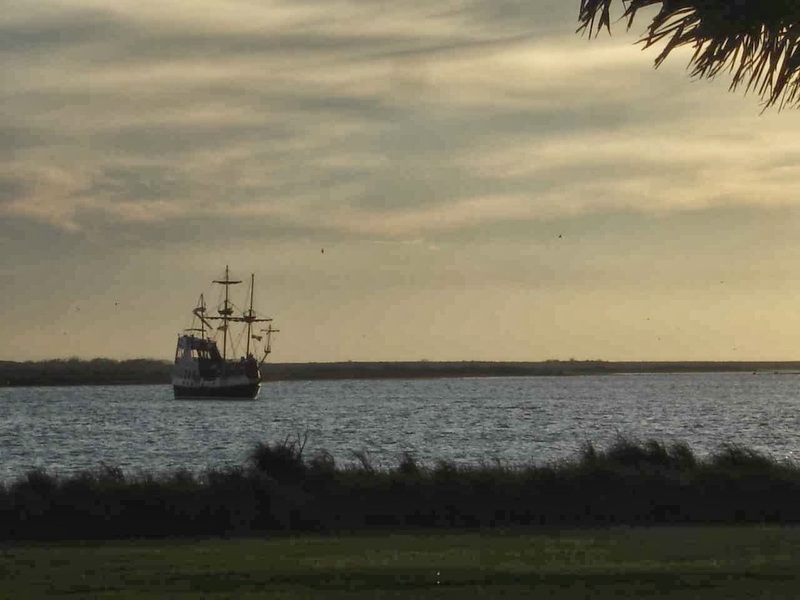 We had to look twice, and then realized it was a pirate ship out for a sunset cruise. 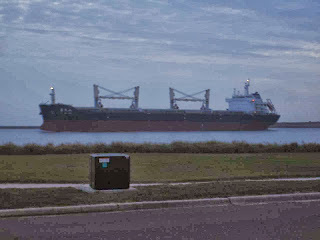 Even more surprising was to see this huge ship , coming so close to shore on its way north. 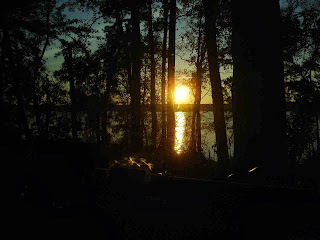 This was also right from our campsite. 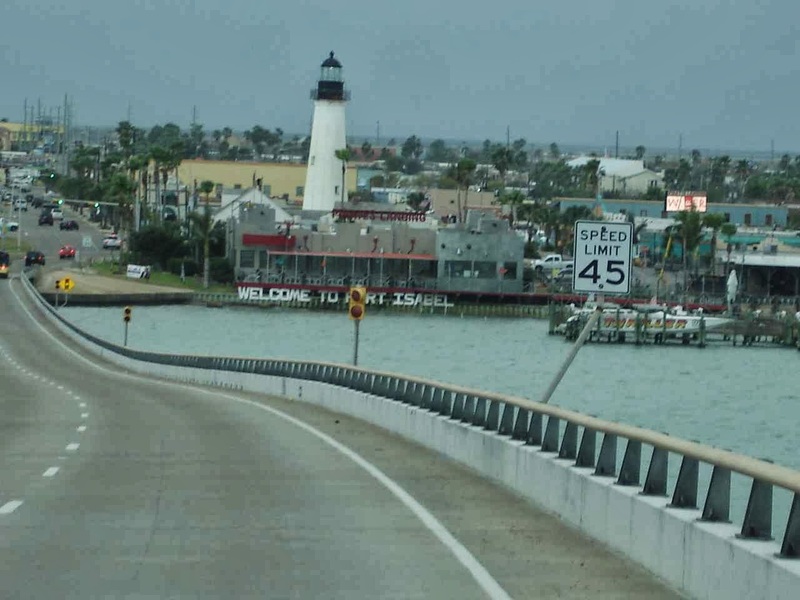 Leaving South Padre gives a nice view of the lighthouse leading on to Port Isabel. 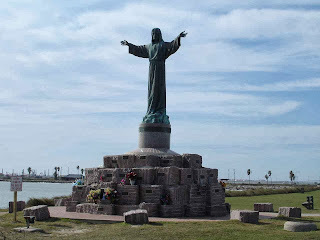 This time, we travel north through Corpus Christi. 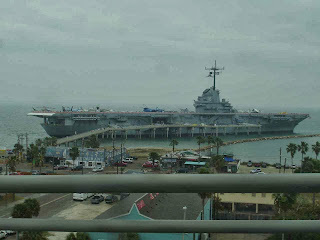 A nice view on our right of the USS Lexington with a number of planes to view , as well, on her deck. This would be a nice stop at another time. Excellent online reviews send us south of Houston to Brazos Bend State park. Jan and I are glad we made this detour. Now it is one of our favorites. It's the weekend after Christmas and we stop in without a reservation. But--we are lucky and get the last site. All the sites are great with lots of room and privacy. It is a large park , with everything well spaced. On a warm holiday Sunday, there are lines of people lining up to enter the park. But there are no crowds inside the park. 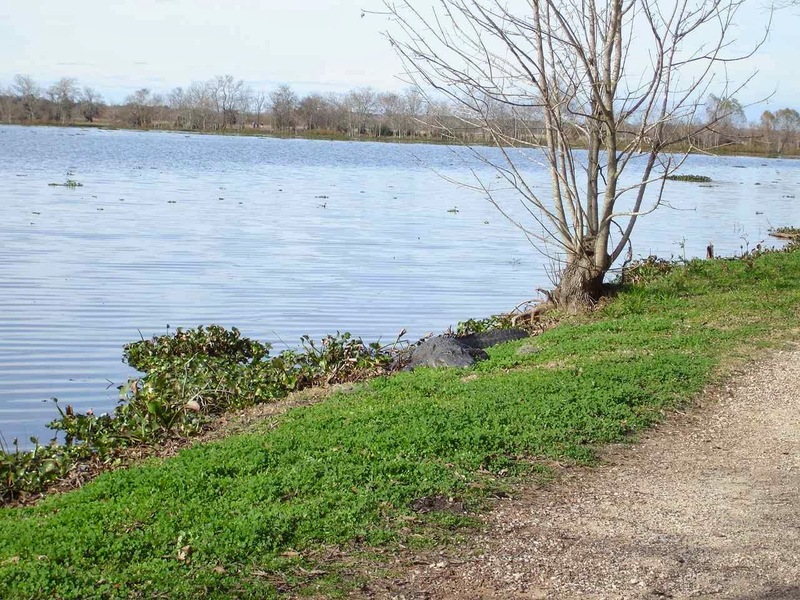 Miles and miles of hiking and biking trails, a nature center with plenty of activities, and even an active observatory. 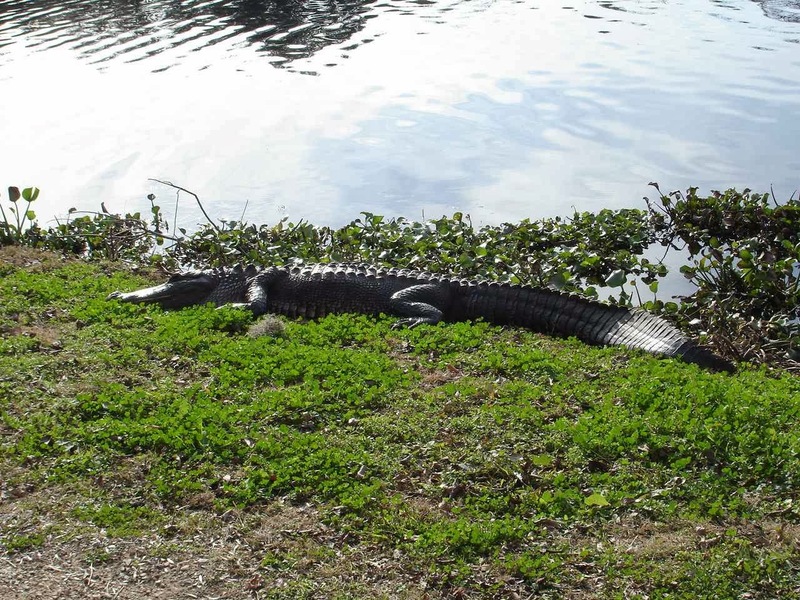 There are over 300 alligators in the park. 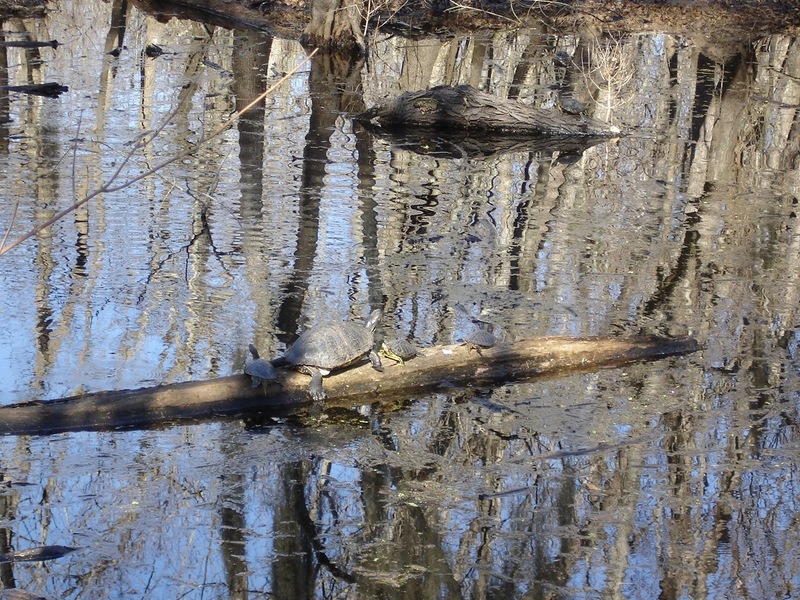 Lots of turtles are enjoying the sun. One youngster also found a snake out enjoying the sun as well. Some are larger than others. I do apologize. 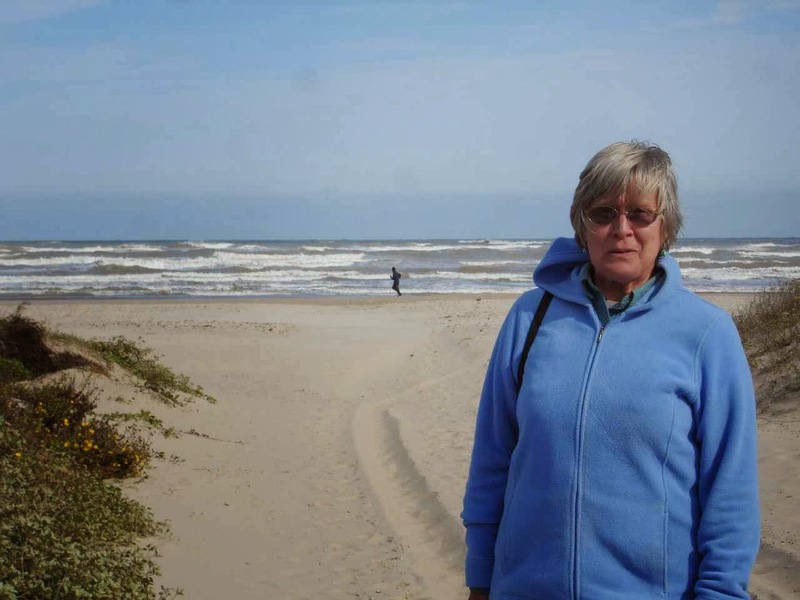 But, Jan insisted that this picture had to be included. The park is something of a wildlife refuge. Lots of ducks. 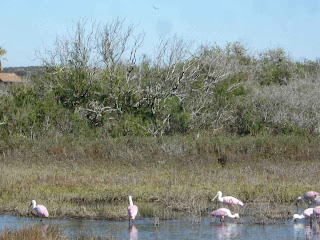 These are ibis, with the long curved beak for picking in the shallow water. We also saw a great horned owl flying from a close tree to another close tree. We were riding our bikes for this adventure. 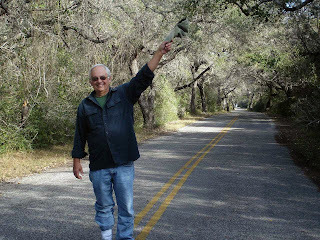 The roads and paths were very good for walking or biking. We also see 20 to 30 alligators on the far shores. He's right along the path. Do you see him? We very carefully go by. I stopped for a second on my bike to take a picture and then away we went. 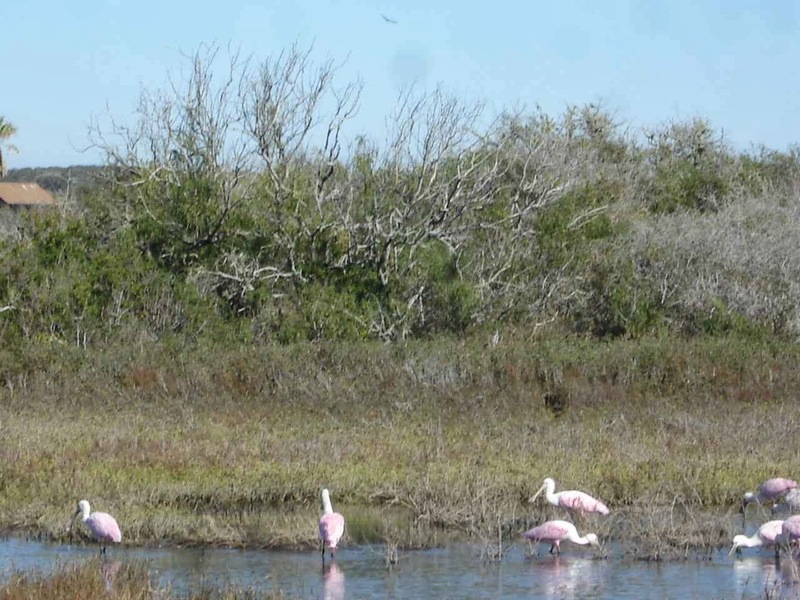 Our last morning at Goose Island and we are surprised by a visiting flock of Roseate Spoonbills. Luckily they stayed around until I ran for my camera. Fascinating to watch. Their heads are down most of the time while they move their head from side to side sort of sweeping for food. 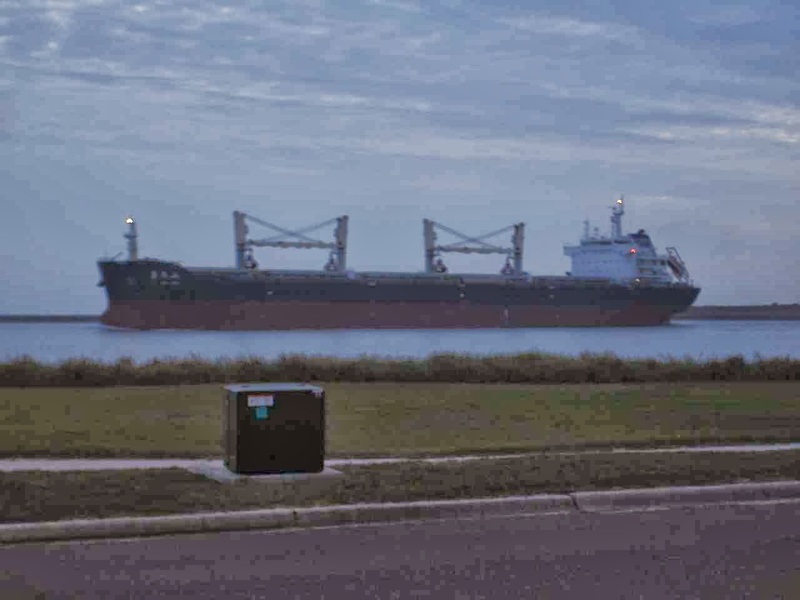 Not easy to get a picture of the "spoon" bill, but if you enlarge the picture to the left , you can see the shovel shape on the bird in the center. 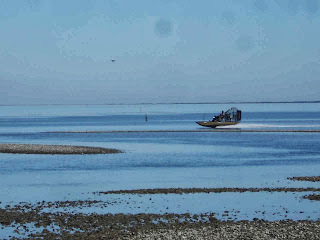 Airboats were a constant from early morning to late in the day. Not too loud from our spot, but close up , exactly like being next to a small airplane. Always have to be on the lookout, especially on park roads. They did post reflectors on the tree ahead on the right. But , you have to be observant on your own and pull into the center. 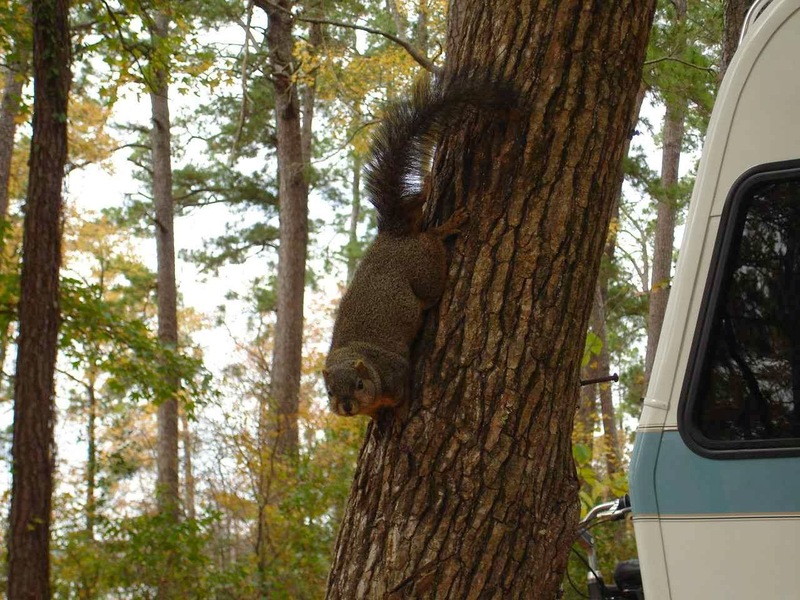 You do not want to hear that horrible scraping sound of your motorhome against a solid tree branch. 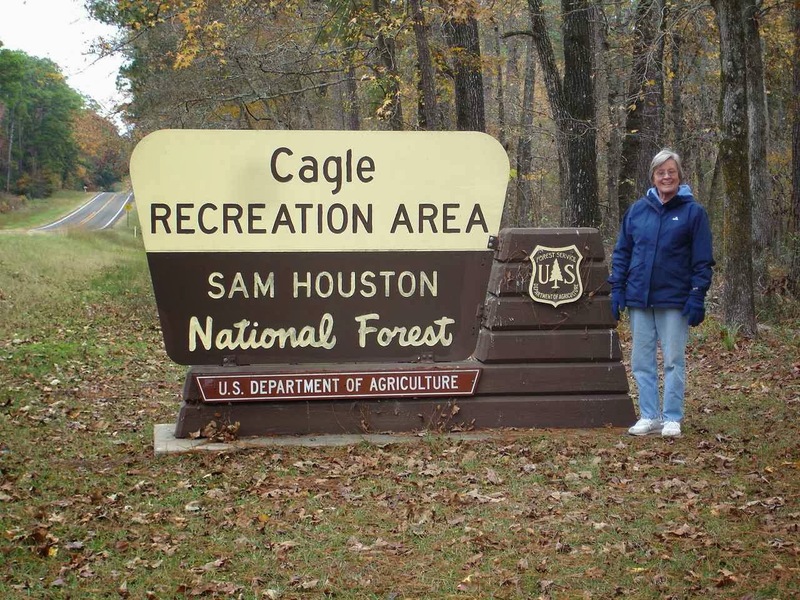 It's not all state parks, national forest, national parks, and corps of engineer parks. 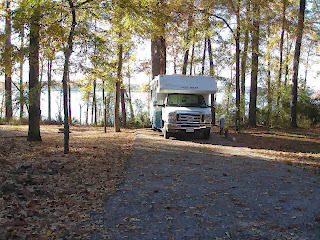 Sometimes we pull into a private park to keep a shorter mileage day or sometimes, just to do laundry. Like many others, this is a Passport America park. 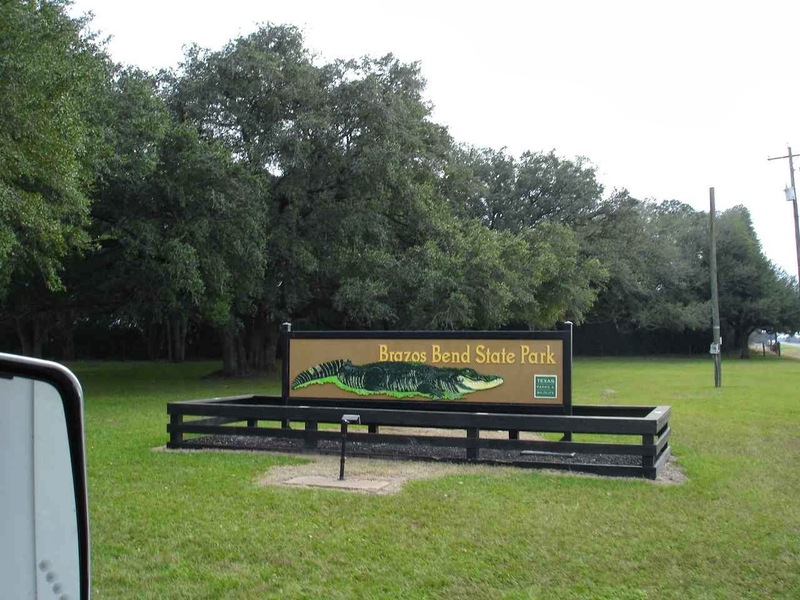 This one is in Aransas Pass and being a PA park we pay half price. 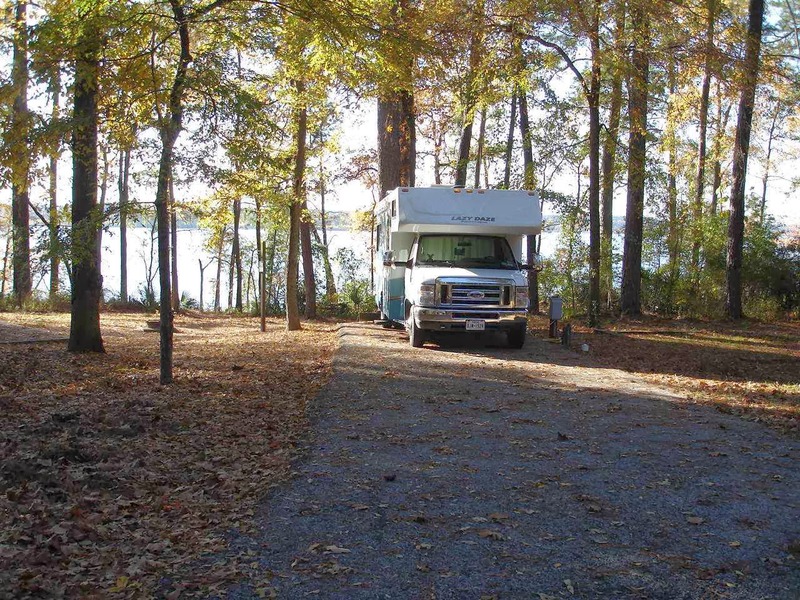 The park is extremely well kept and the staff and campers are very friendly. 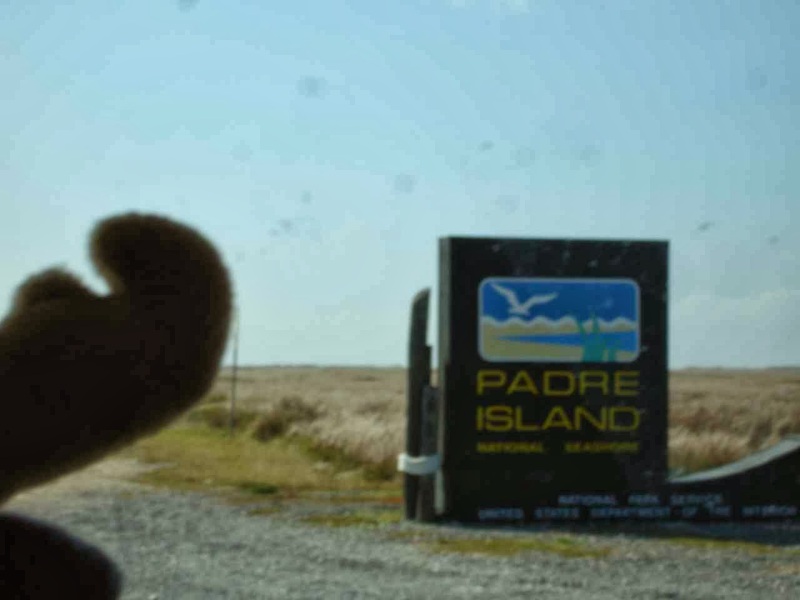 If you have followed our blog, you note that the sites here are much closer together than in our other parks. A plus of this park, in addition to a very neat laundry, is Mickey's Bar and Grill. 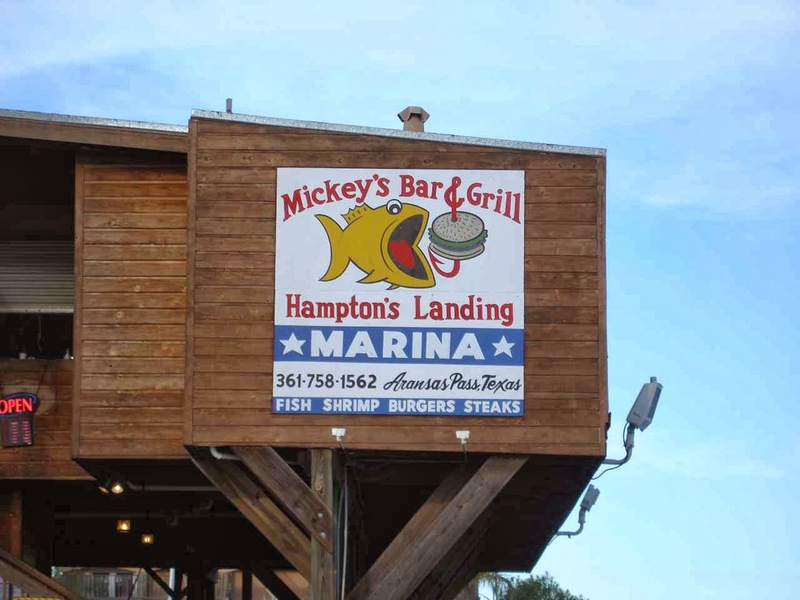 It is a great little restaurant within a short walking distance at the marina. 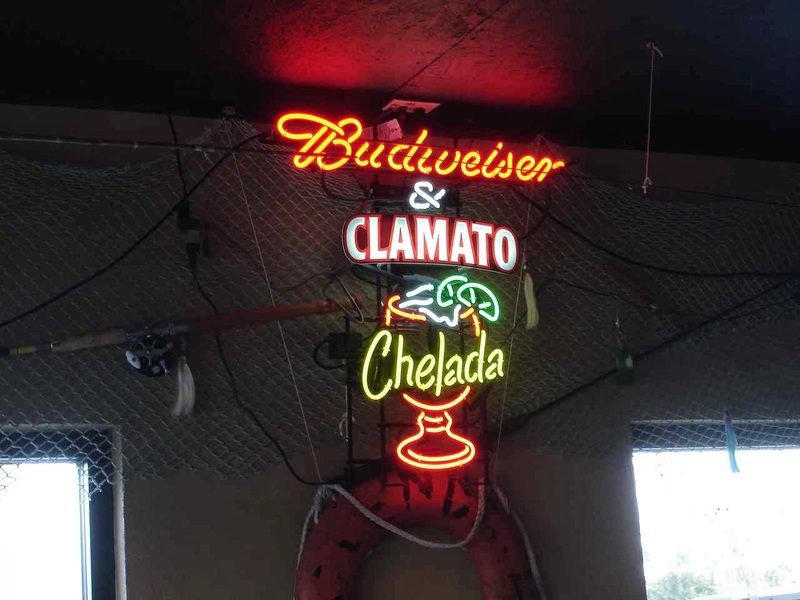 We had to try the fresh raw and fried oysters as well as some wonderful shrimp. 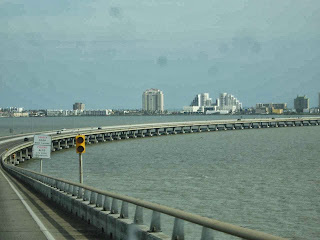 A short stay in Aransas Pass and we are on our way to Padre Island National Seashore. We should have known, but we missed it on the map(tiny letters) and the gps(late). 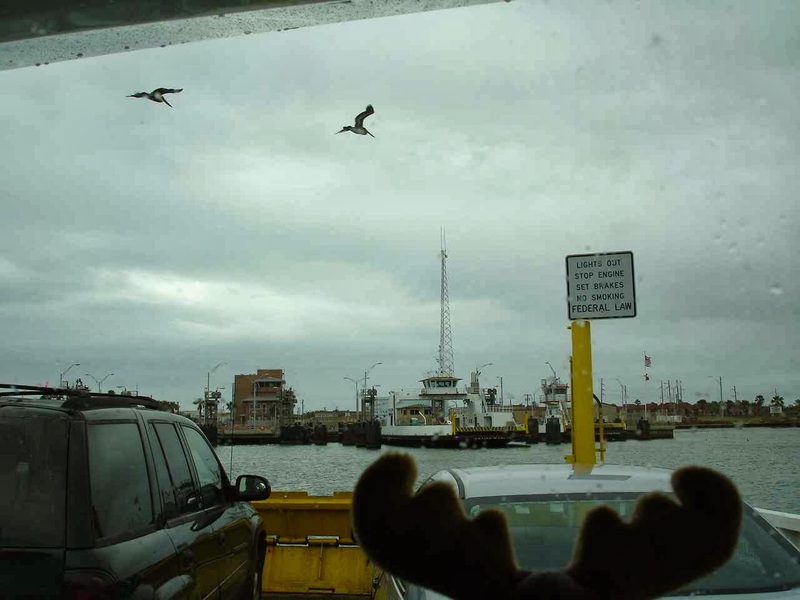 Suddenly, we are funneled onto a ferry boat. No problem though. Free and a very short ride---but fun. Had to keep an eye on Eustis. He got all excited. 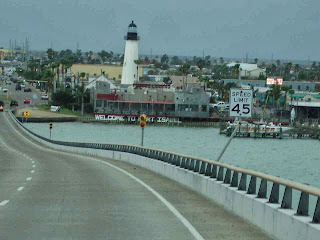 We exit the ferry at Port Aransas and head south to Mustang Island and then Padre Island. We are on Padre Island. 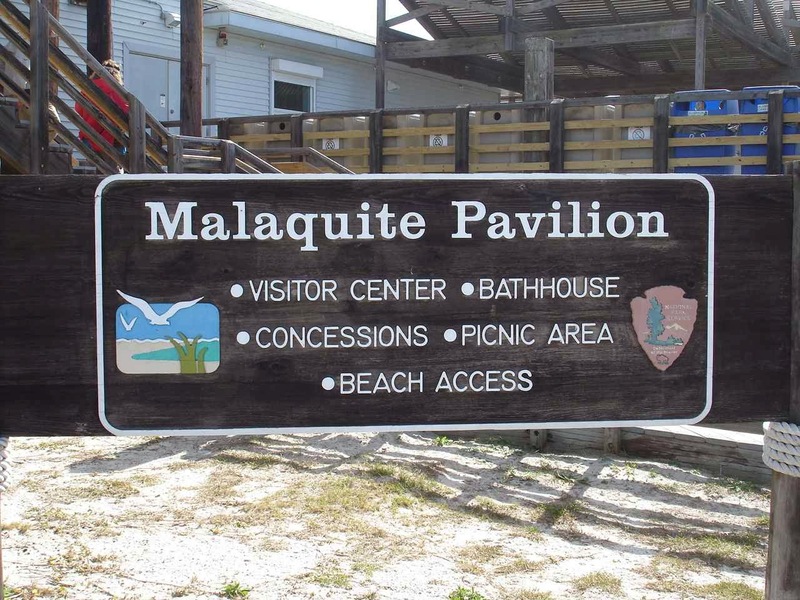 This is the national seashore , which is just miles and miles of beach and a visitor's center, and dry camping. 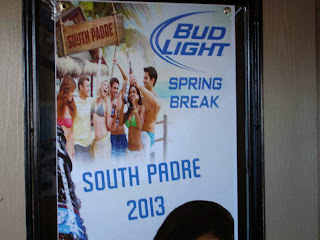 South Padre is that famous college spring break stop--whole different thing. First stop is the visitor's center to check on camping spots. 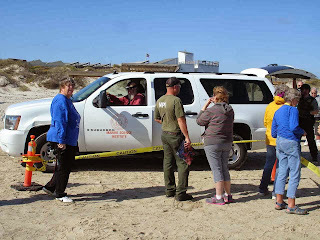 Very good rangers and hosts inside to give us all kinds of information. Plenty of camping sites at the Malaquite campground. 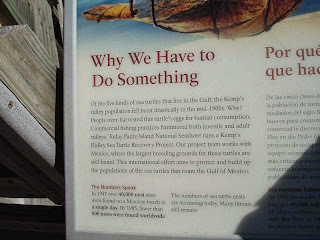 Just as we walk up the steps, a ranger informs us that we are just in time for a turtle release. Down to the beach and here comes a parade of vehicles. From the Marine Science Institute. There are 100 turtles to be released today. 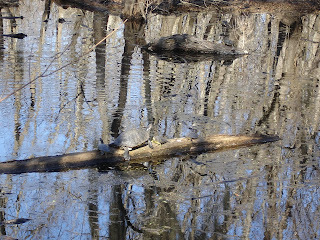 The cold weather a while ago has left many turtles dazed and floating on the water or beached. 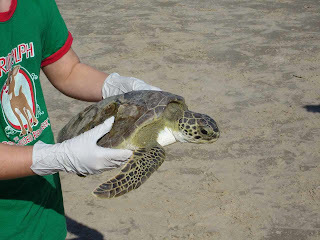 The rangers, volunteers, and institute workers collect them and nurse them back to health until the water warms up. 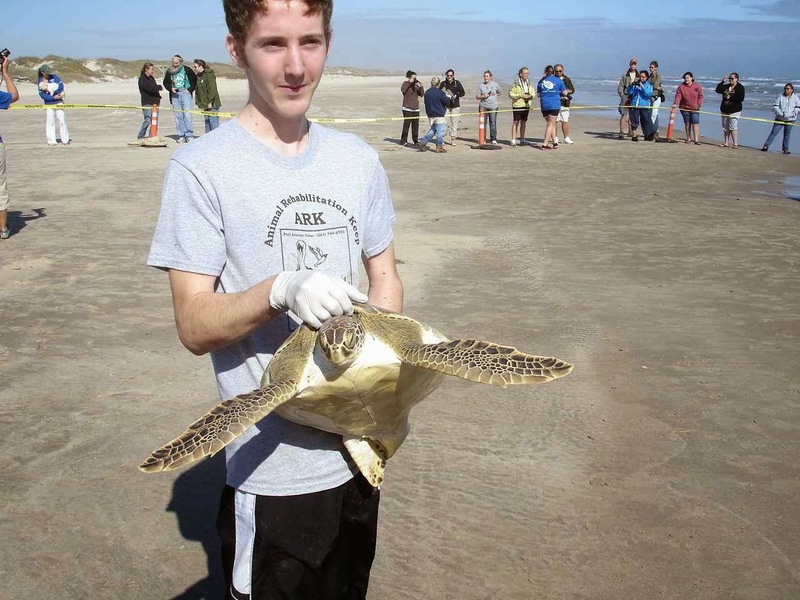 Some volunteers are young and obviously extremely happy to be releasing some of the turtles. 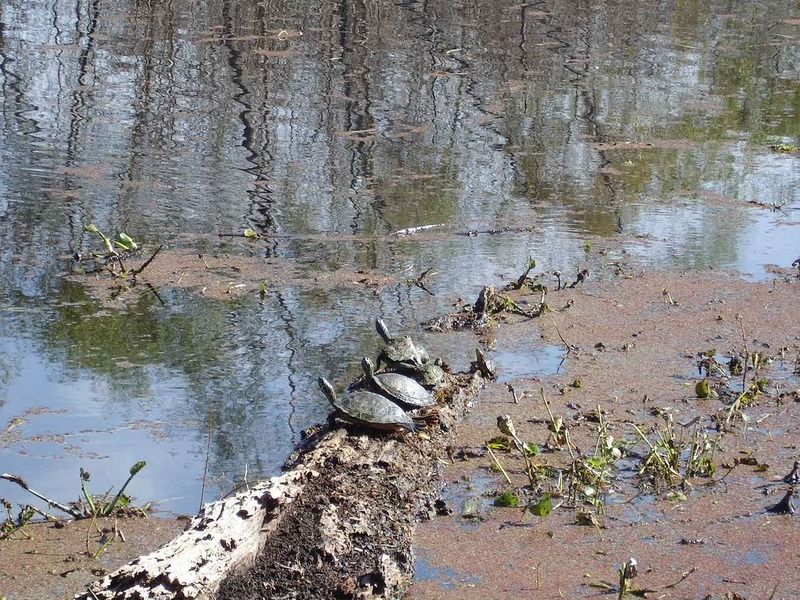 These are green turtles. 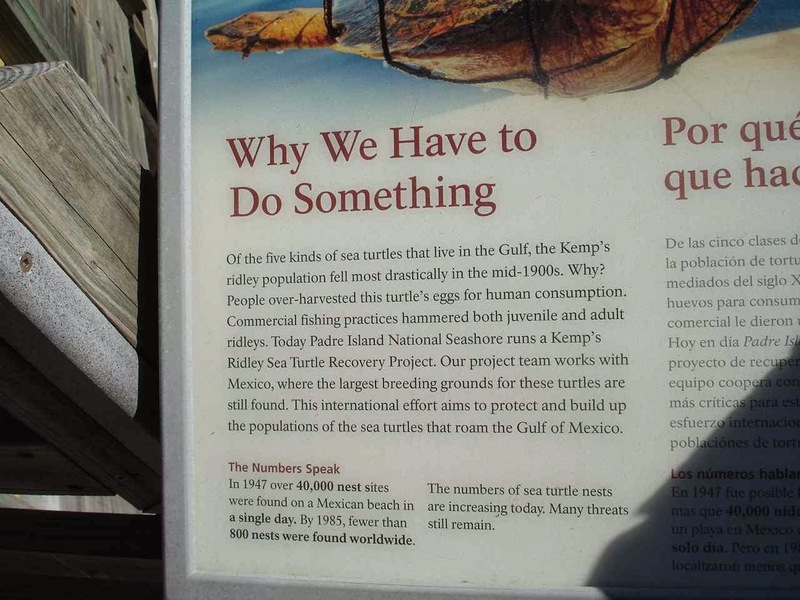 In the spring and summer there might be the Kemp's Ridley turtles that beach themselves. The flippers are all excited to get into the water. 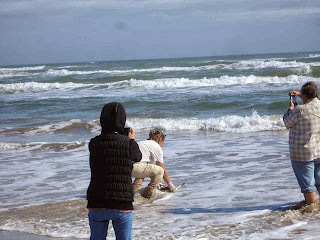 One of the institute workers even has an underwater camera to record their return to the sea. 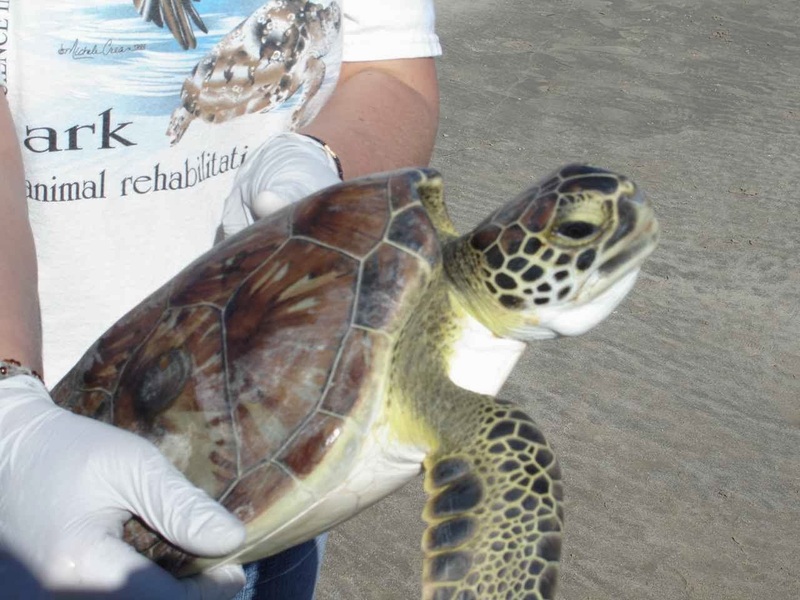 Some of the Green Turtles are fairly large, but they do grow a bit larger than this. His t-shirt says Animal Rehabilitation Keep or Ark for short. One of a number of species that would be gone without some kind of intervention. 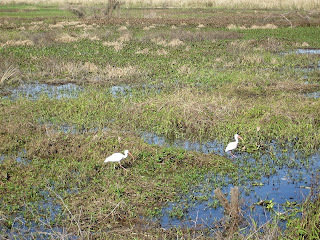 Just back up at Goose Island was the evidence of the Whooping Cranes that would be gone except for intervention. 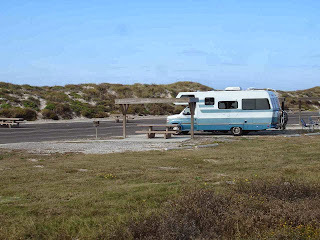 Lady Blue loves her site at Padre Malaquite campground. 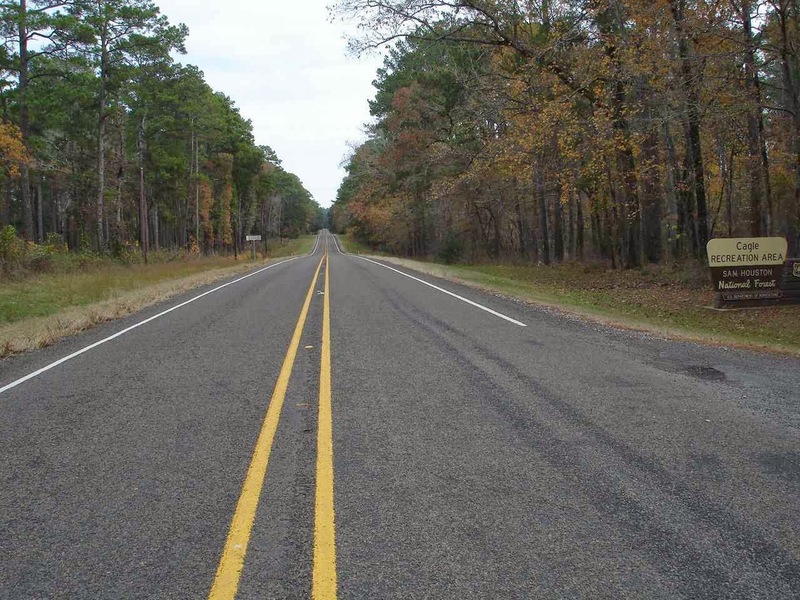 As a national park, we use our America the Beautiful Pass. There are no hookups, but there is fresh water and a dump station close by. The cost is $4.00 per night. Not sure if we can follow all------of these rules. You knew it was coming. 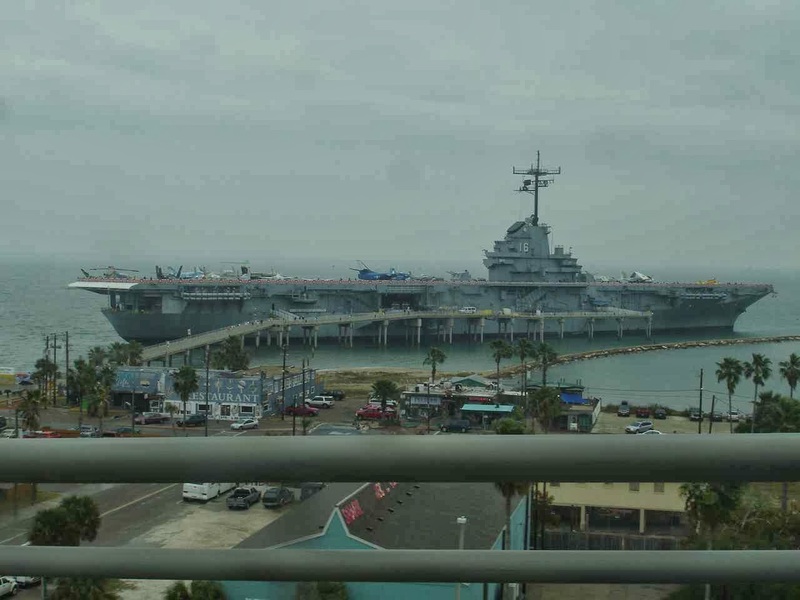 The view out Lady Blue's back window. Now one of our favorite spots. 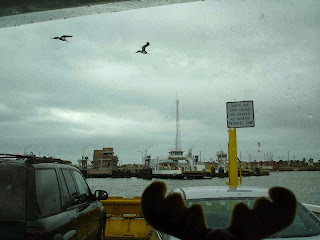 As you noted, this is not Goose Island. 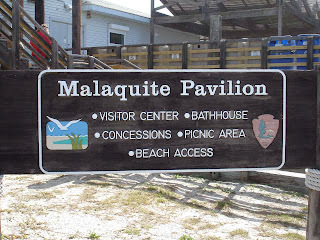 But this is our first stop after Lake Livingston State Park. Actually , we are not quite done with Lake Livingston as we will need to come back to visit our friendly dentist one more time on New Year's Eve day. Not quite the celebration you have in mind? Cagle is a National Forest Campground. And though it is one of many in Texas, this is one of the best. 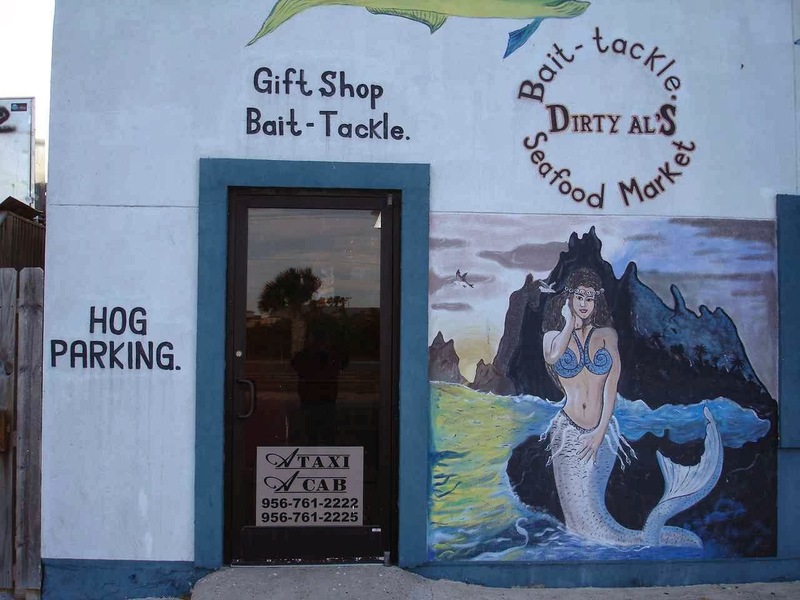 Well maintained and friendly staff , you might find it full on a weekend. 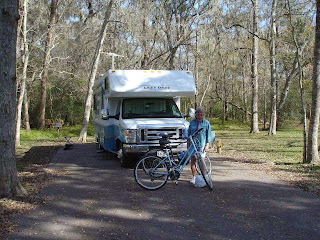 Cagle has two camping loops and all of them have full hookups for $10 per night on our old geezer pass. Our site has a beautiful view and lots and lots of room on both sides with Lake Conroe in our back yard..
Quite cold this stay, but there were still some diehard fisherman using the boat launch. 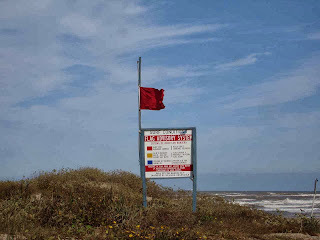 The reservation pole at the front of each site indicated a full campground for Christmas vacation. 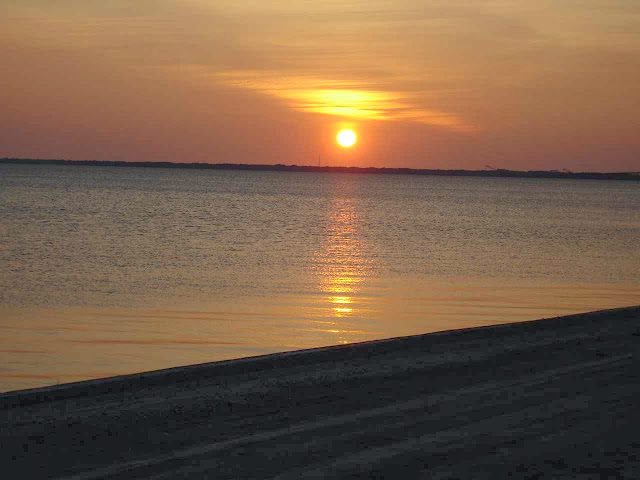 Oh yes, one more sunset! Had to include this one because we have had so many days of cold and rain with no sun. Have you seen that ad on TV where the guy is attacked by not so friendly squirrels? This one made us a little nervous because he came down the tree and then right up to us. All we could figure was that he had been fed by a number of previous campers. He was rather large and a lot darker than our northern squirrels. Still trying to stay off the interstates where possible. However, not too many choices coming by Houston. Huge , busy roads, some were as many as six lanes wide. 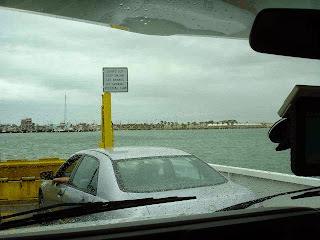 But the signage is good and the GPS is very good about indicating which lane is necessary before and after toll booths, as well as exits. 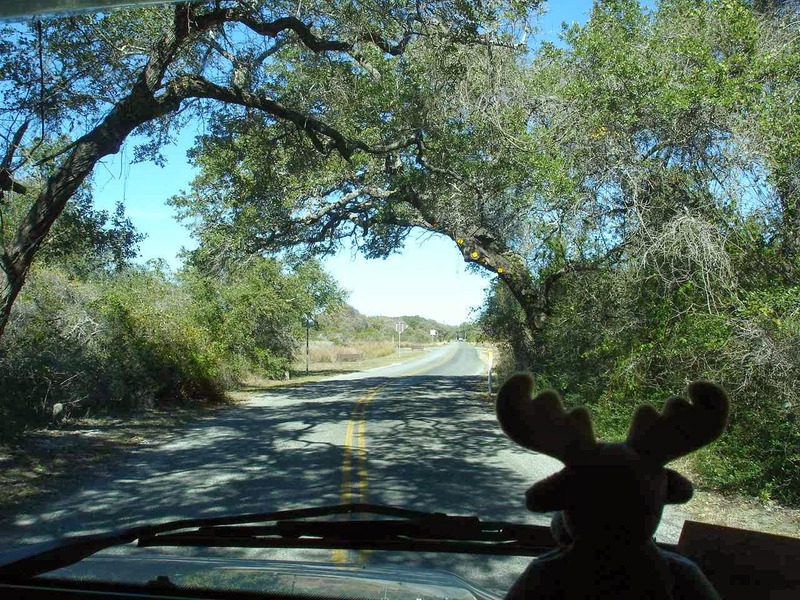 This kind of road is our favorite, though. 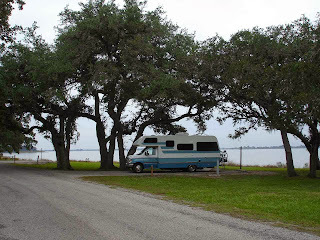 South of Houston, we stop at what was once, Lake Texana State park. 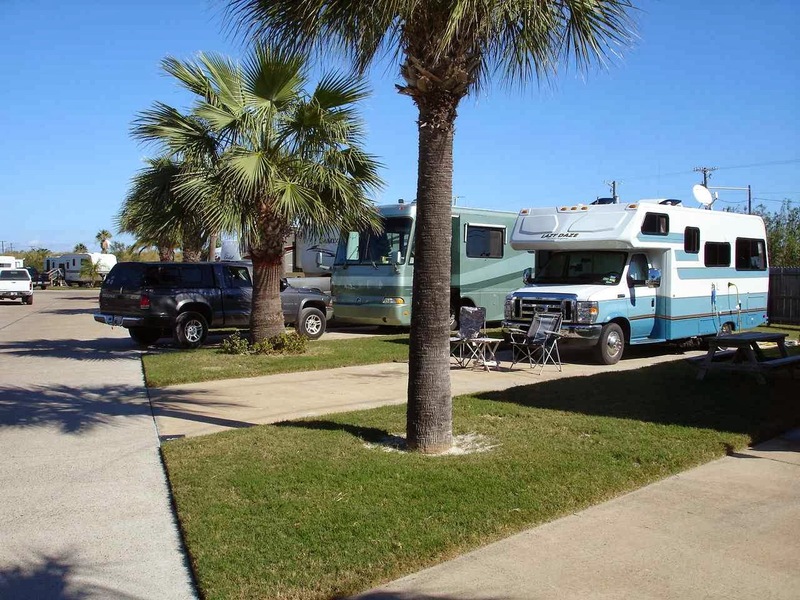 Now it has become a private park, run by the same owners that run a private campground across the street. 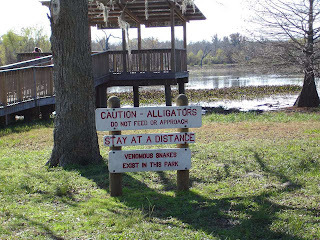 The park is well maintained with a very courteous staff. The price is similar, if a few dollars more. Still better than many private parks. Lots of space. After one night, we are once again heading south and west. 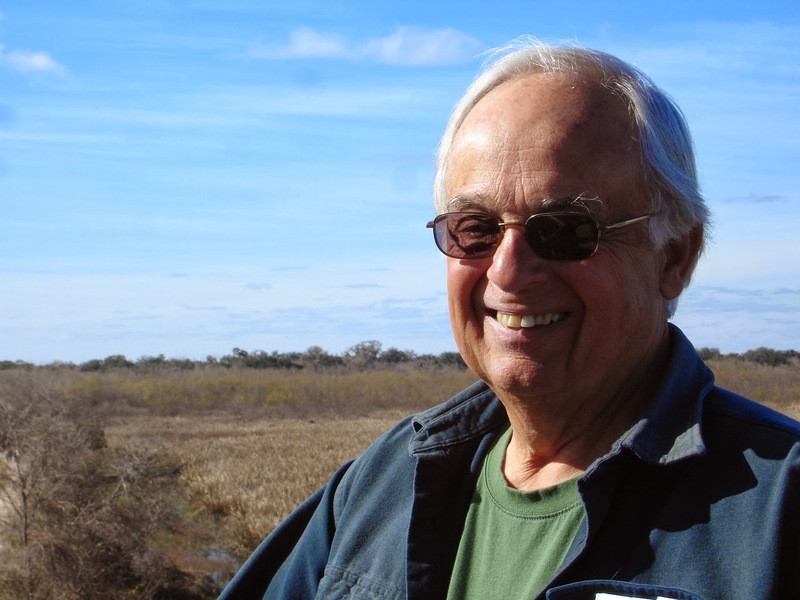 Eustis notes that the land has become very flat, with lots of water here and there. Also, many large farms along the way, all being cultivated for the winter after what looks like grains--perhaps rice and /or cotton. And we arrive at our new stop. 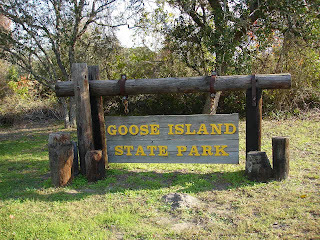 Goose Island State Park in Rockport, Texas. 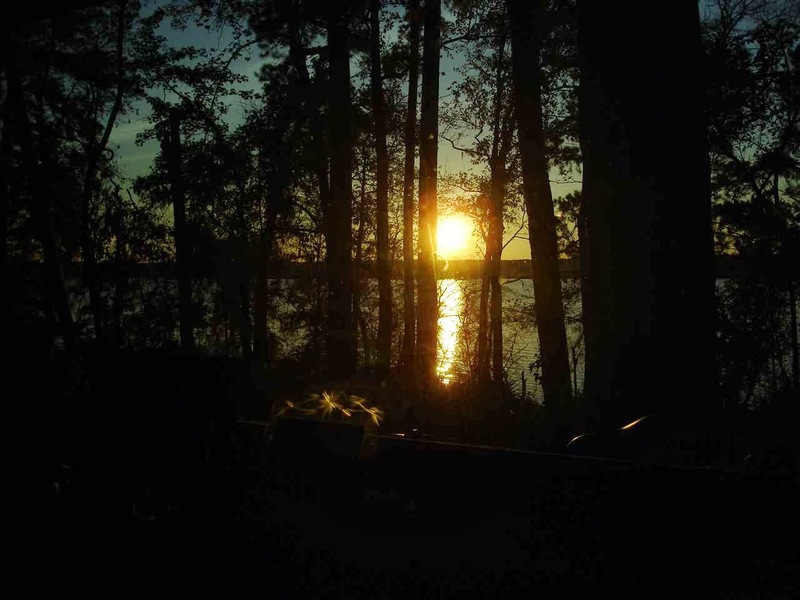 Can't resist taking a water site, but the woods sites are almost as tempting --and less expensive. Can you tell? 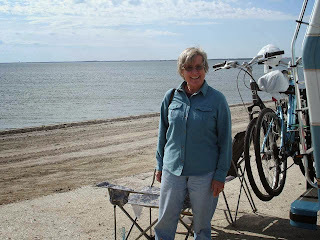 Jan is happy with a view out over the Gulf. We are also happy for another reason. We stopped at a small town north of here to mail Christmas cards. 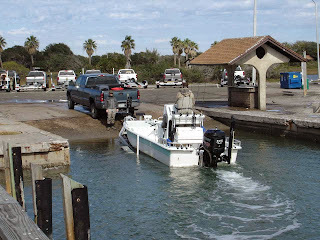 At the same time , we noted that the "check engine" had come on in Lady Blue. Oh no!! So, we check the GPS and find the closest Ford dealership------3/10 of a mile from the post office. And, we find it is a large and still growing dealership that can handle larger trucks. And---we find it is simply a O-2 sensor in the exhaust. What a great dealership. They met us in the parking lot as we arrived and less than 15 minutes later, Lady Blue was in a stall being checked. Unfortunately, the part was not on hand, but we will go back when the part is in and have it replaced---on warranty. 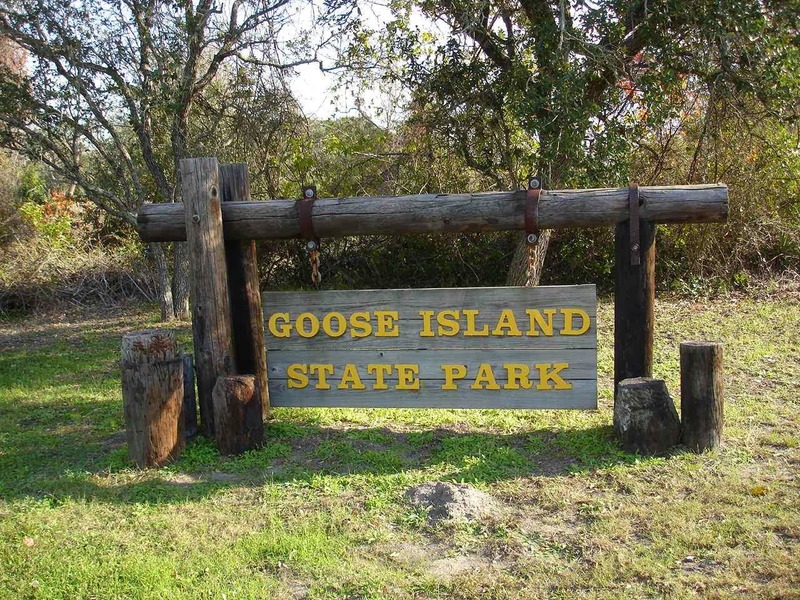 Goose Island is a busy park for campers, fishermen, and hunters. We walk over to one of the boat launches and see not only fishing boats like this. But, also air boats such this one on the left. The fish cleaning station is getting a lot of use. but, we also see a number of hunters in camouflage. 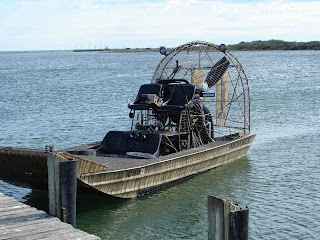 Seems it is the reopening of duck hunting season and the air boats are the way to go down on the Gulf. Lots of birds to watch. Brown pelicans are always fun to watch. 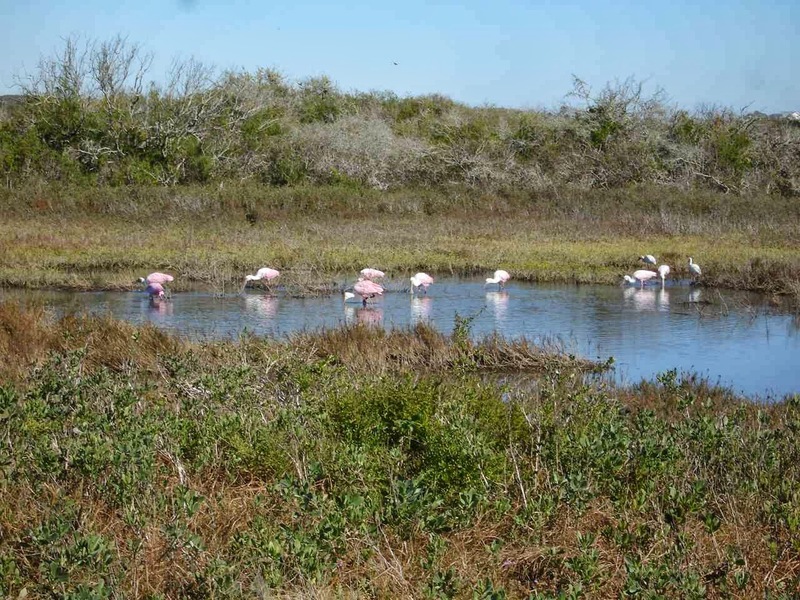 They are entertaining with lots of splashes as they fish--or sometimes just landing. 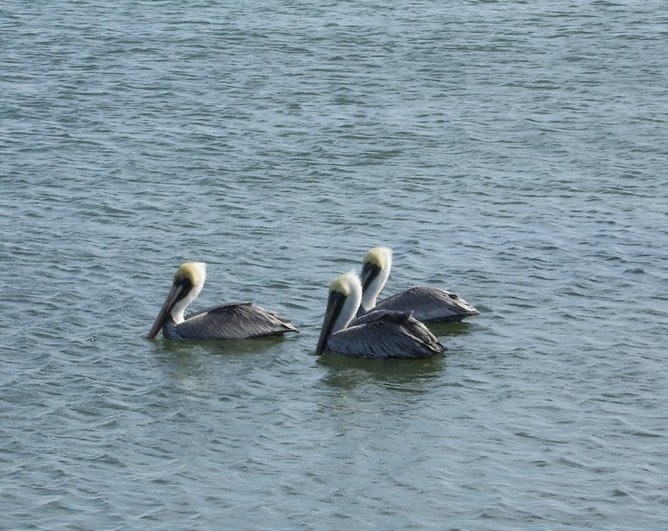 Right there with them are the white pelicans, who seem a lot more sophisticated----not so much splash. 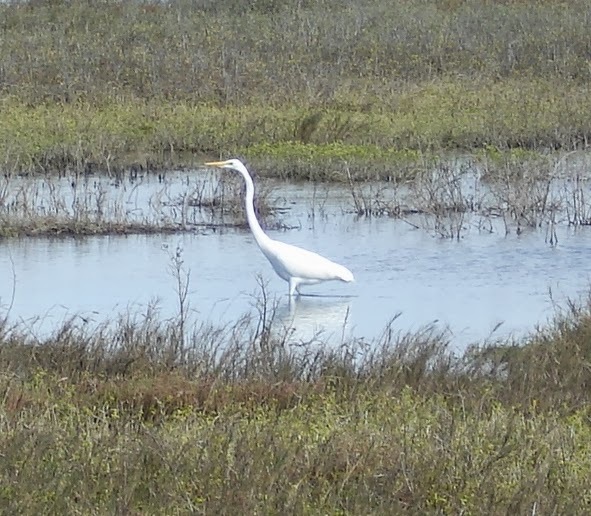 Along with the pelicans are white and blue herons along the shoreline. 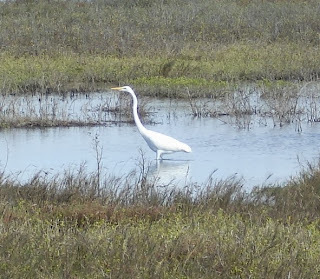 Some smaller egrets are here too and even a sighting of an armadillo. 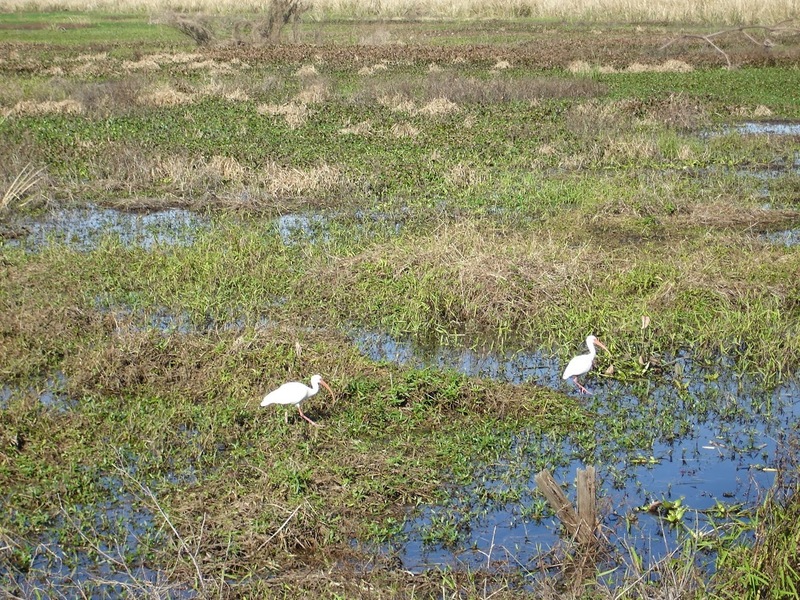 This is also winter nesting area for whooping cranes. The office indicated that they are around, but we haven't spotted one yet. Part of the park we walk to includes this huge fishing pier. It must be about 3 football fields long or longer. 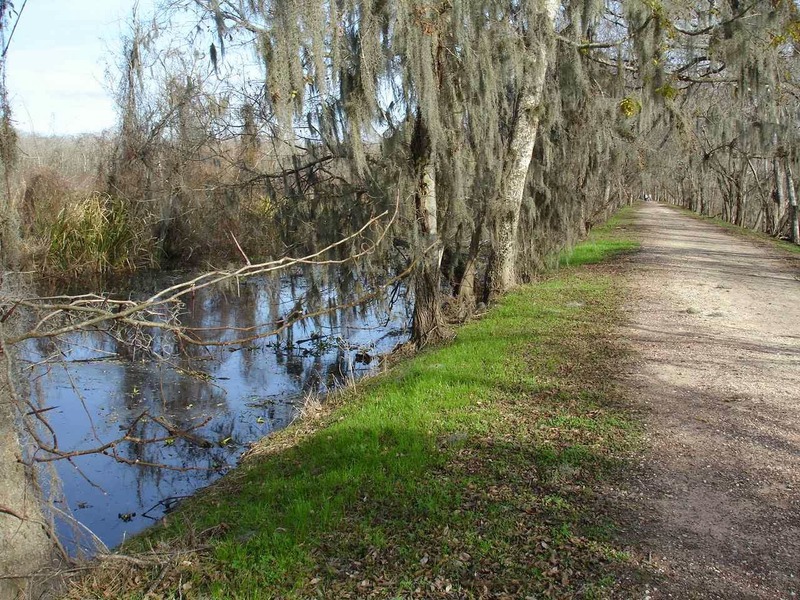 As you can see, part of it is raised--over a channel. 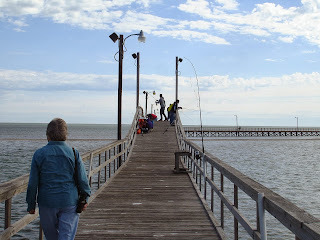 There are lights all along the way, stairs down to the flats, fishing pole holders, fish cleaning stations out on the pier with running water. Texas takes good care of its sportsmen. 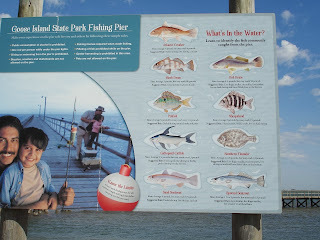 There are a lot of salt water fish that are caught right from the pier. Saturday finds a number of families and individuals dropping a line. 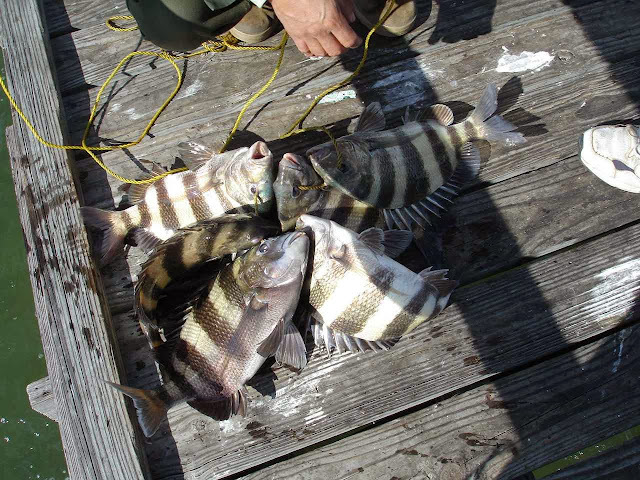 This fisherman had caught a number of sheepshead. 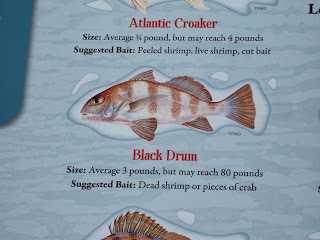 They are good eating fish . 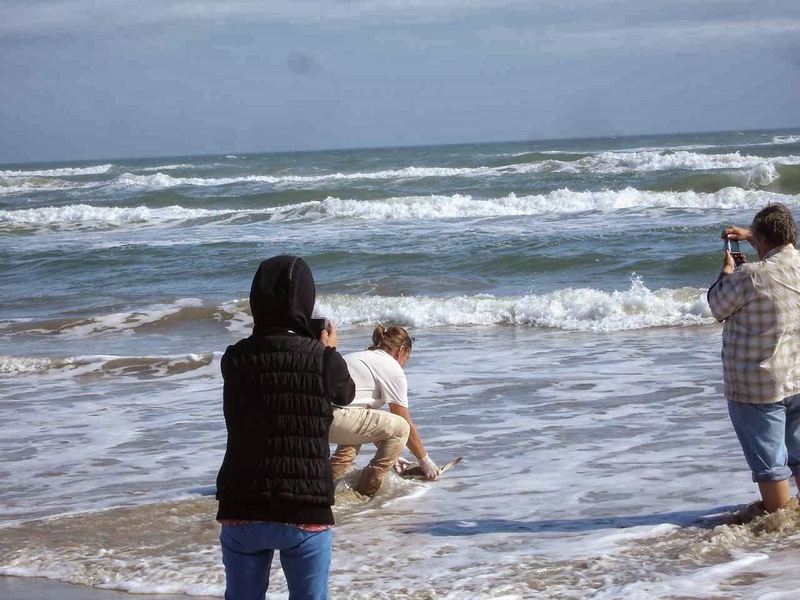 The ranger is right there and he points out the large , spiny , topfins that protect them from larger fish like the dolphin. He also shows us their human like teeth--rather unique--that they use to eat the barnicles from the pier and the rocks. While we are at the office, a lady comes in to show us pictures of a black drum fish she caught last night. This fish is almost as tall as she is!. She had to have someone else bring it up to the pier. 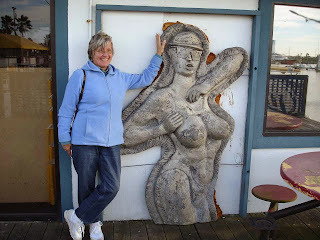 Evidently, she caught it at night from the pier. But, what a large fish--took her almost a half an hour to land it--with help. 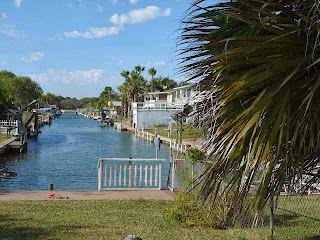 Some of the houses here remind us of Florida. 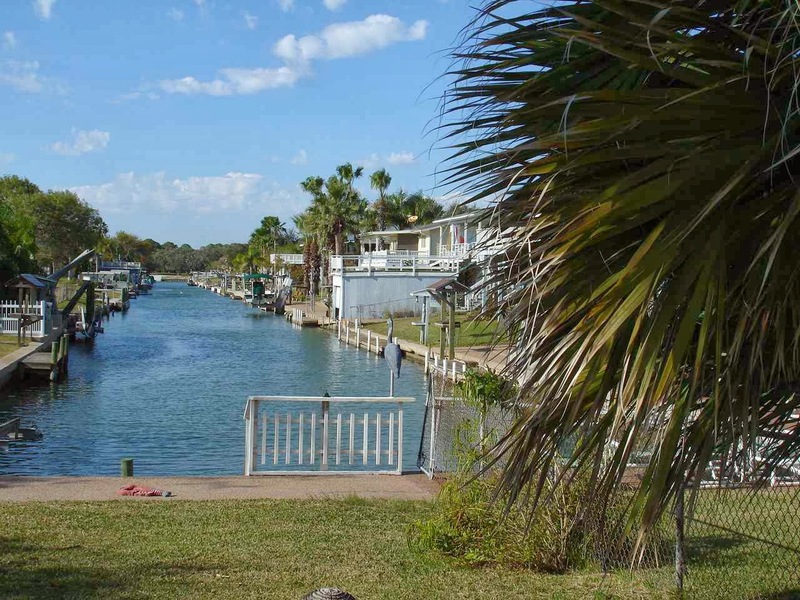 These houses are built along a man made canal where they can keep their boats in the back yard and have immediate access to the Gulf waters. 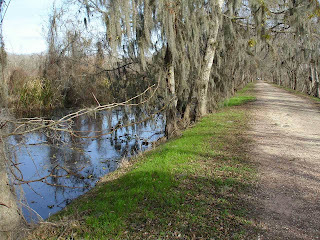 A bike ride takes us into live oak tree lined back streets. In the distance you can still see the Gulf. 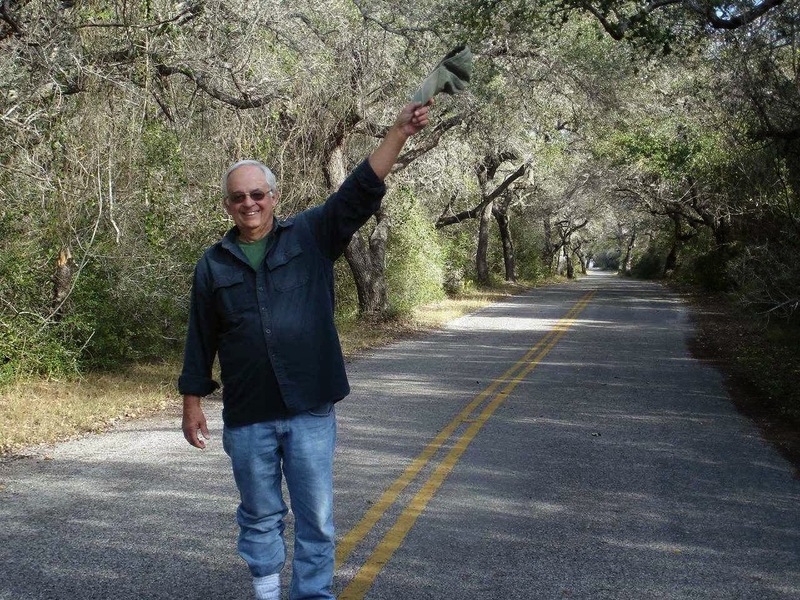 What a wise guy---standing in the middle of the street? 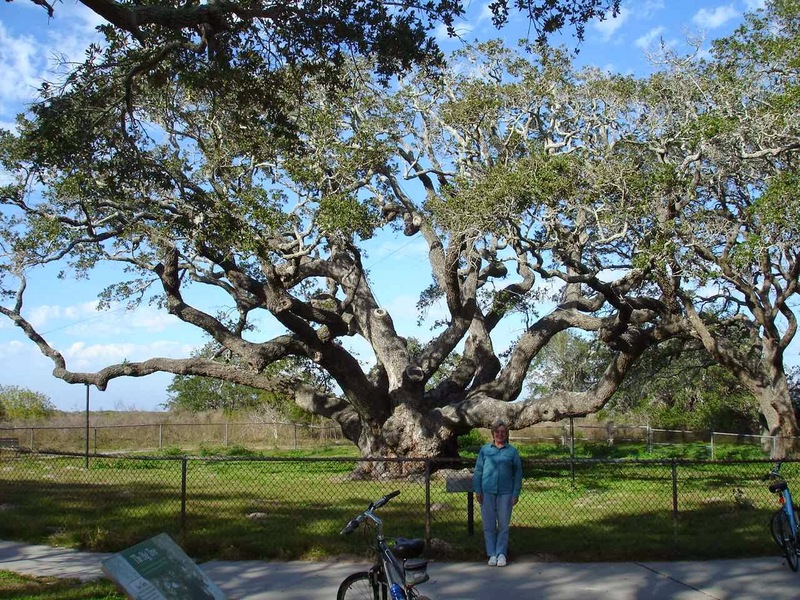 Along the bike ride is this huge live oak. 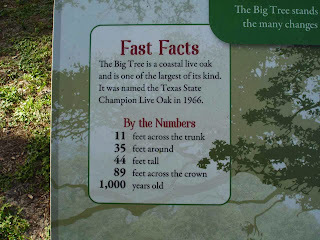 One of the oldest in Texas. 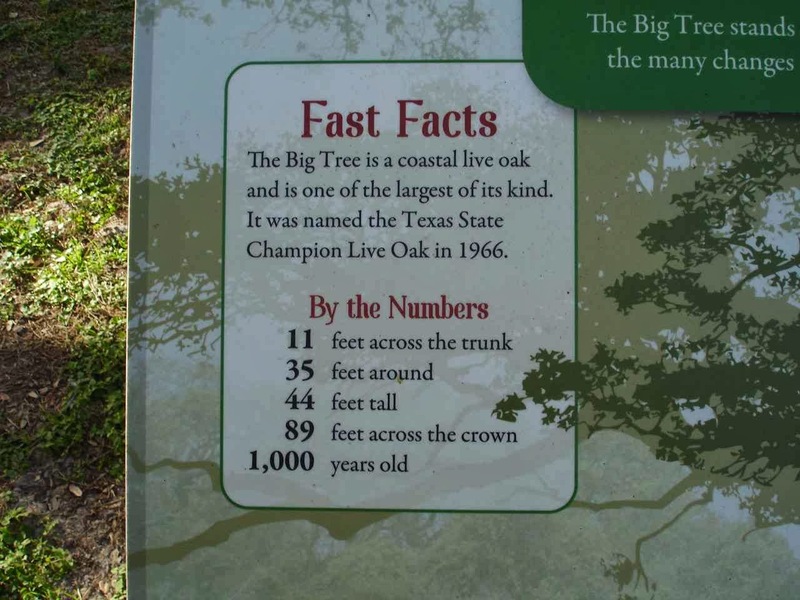 It's name is "Big Tree". 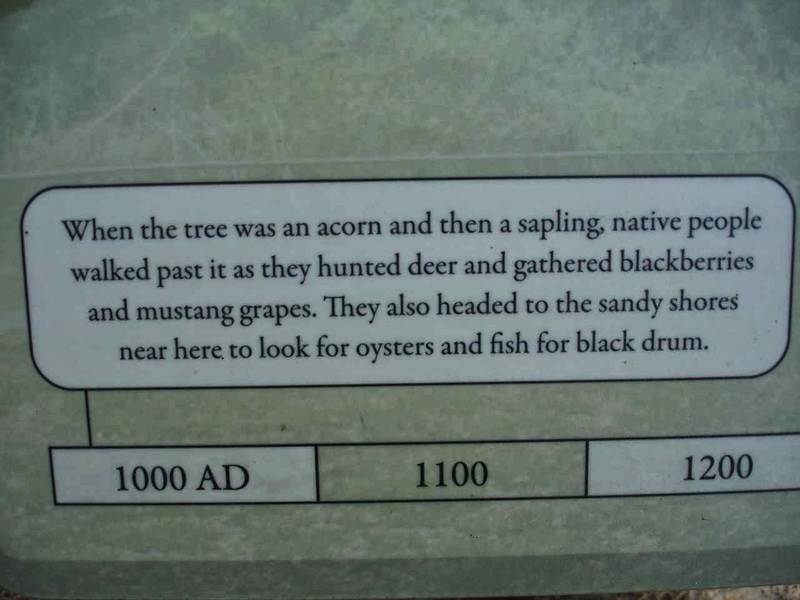 If you can imagine---1,000 years old. 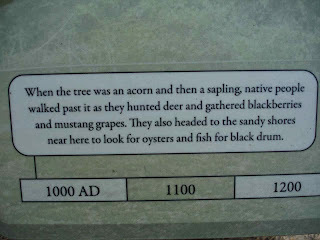 Actually , over 1,000 years old. Back centuries before the Spanish explorations. Okay Bruce--enough with the sunsets. Well. one of the reasons for this picture is to see if this reminds you of anything? How about Herring Cove beach on Cape Cod? That's what we thought. And this picture is-------yes-----from inside Lady Blue. This picture is from the back of our site--not inside but right beside Lady Blue. There is a wetland area --for whooping crane nesting-no access , then an inlet and beyond that some rather impressive houses.